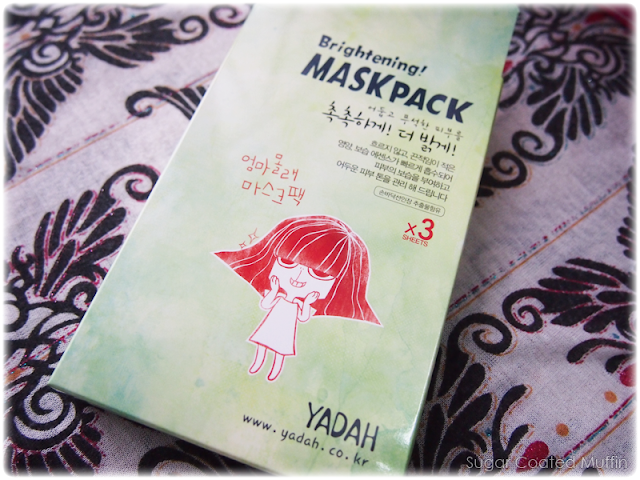 This box of mask from Yadah was part of my parcel from HiShop. Yadah is a range of natural skincare products formulated with plant extracts like essential oils, floral water, traditional herbs, fruits and flowers. They are 100% free from artificial colourings, preservatives, mineral oil, sulphate and parabens. 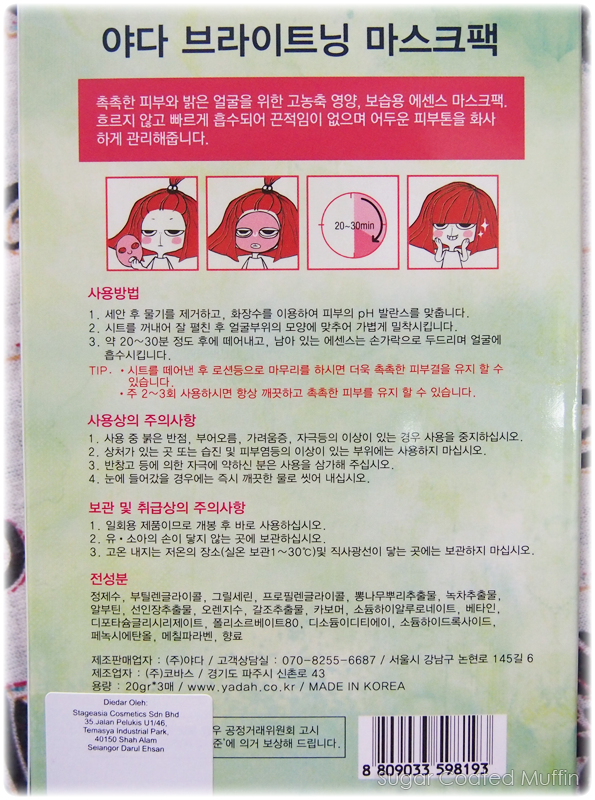 All Yadah products are hypoallergenic, non-greasy and non-comedogenic and certified by the Korean FDA. Does not contain any animal ingredients nor tested on animals. 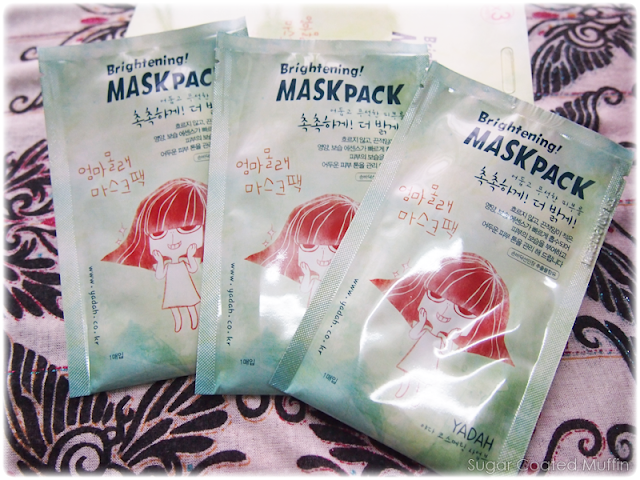 The mask functions not only to brighten but to moisturize as well. 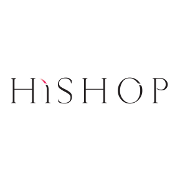 "This mask is drenched in a potent essence formulated with a combination of natural plant extracts comprising white mulberry root, camellia leaf, green tea, orange flower and algae for their curative hydrating and anti-oxidant properties. Absorbs easily into the skin to help brighten and moisturise the complexion naturally. Formulated to reduce pigmentation and freckles by inhibiting the production of melanin leaving skin noticeably clearer and brighter. Use weekly to rejuvenate skin cells and restore skin fairness. Key ingredient Opuntia Ficus is a unique cactus species organically grown and cultivated in Korea known for its strong anti-inflammatory and high potent anti-oxidant benefits that also improves the retention of moisture in the skin." There are only 3 pieces in a box and it's priced at RM 19. 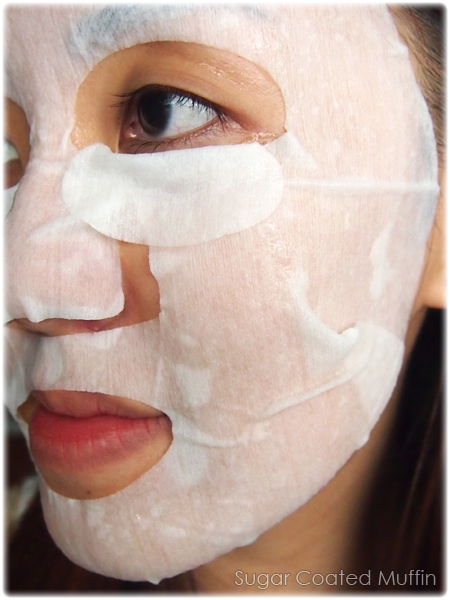 The mask has a floral scent and is made of a thick material which absorbs the essence well, leaving an abundance of essence to pamper your skin. Comes with eye flaps but I had things to do so I just folded them to cover my undereyes. The size is a bit too big for my face. Didn't dry up on me after 20 minutes which is good! 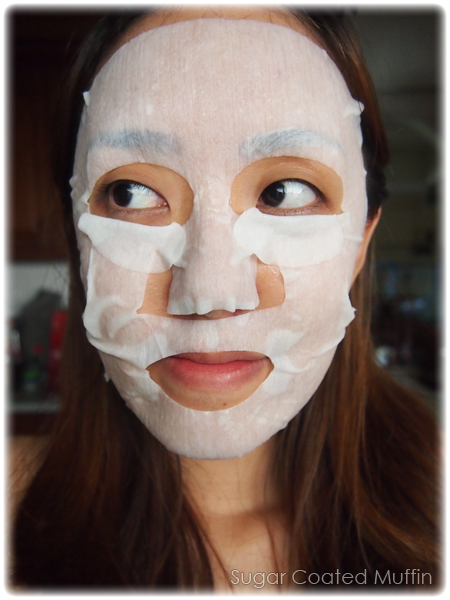 The mask worked at pumping moisture into my skin. I read the word cactus somewhere and somehow I imagined it like I had pieces of cactus (minus the thorns) on my face! Probably cos it's so moist and full of essence. Haven't heard of this brand before but omg the drawings on the box are so cute! haha!